Bored of the under performance stock stereo system in your car ? Upgrade with this complete car audio system bundle package to get a high performance, crisp clear sound And add more cool features to customize to your preference to enjoy your favorite music to the fullest while you drive. Detachable face with 13-digit LCD display and red button illumination. Digital Track Expander improves the sound of heavily compressed music files. 1 Preamp Output: Front, Rear/Sub. Plays Dual AUX, CD-R/RW, MP3, WMA, WAV. Peak Power: 600 watts, RMS: 90 watts per pair. 6"x8" carbon mica Ferrite Magnet woofer. Length Of 50 Feet, 16-gauge wire. 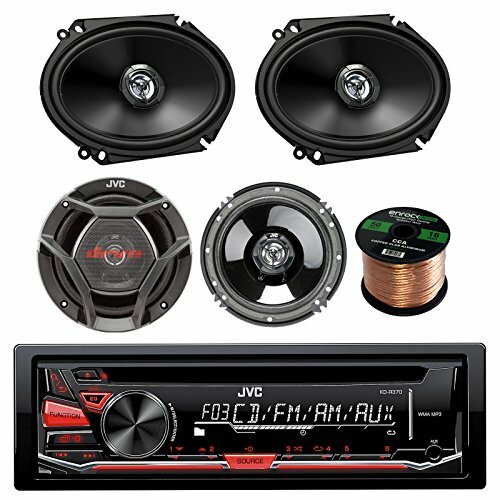 PACKAGE BUNDLE KIT INCLUDES: Total of 4 Speakers = 1 JVC KDR370 Single DIN Bluetooth In-Dash Car Radio stereo = 1 Pair of 1 Pair of JVC CS-DR6820 300-Watt 6" x 8" Inch 2-Way Coaxial Car Audio Factory Upgrade Speakers = 1 Pair of JVC CSDR620 DR Series 300 Watts 6.5" 2-Way Coaxial Car Audio Speakers = 1 50 Foot 16g Wire for speakers. STEREO RECEIVER: This JVC's KD-R370 CD receiver delivers strong sound without costing a ton of money. It includes a sensitive AM/FM radio tuner, CD playback with MP3 and WMA compatibility, and a front auxiliary input, so you can hook up your smartphone or portable music player to expand your music options. A built-in 3-band parametric equalizer, twelve EQ preset settings, and loudness controls let you tweak the sound of your music. JVC included a set of preamp outputs and a low-pass filter. 6x8" SPEAKERS: JVC uses a lightweight yet durable carbon mica woofer cone for a smooth, consistent performance and a 1" balanced dome polyetherimide tweeter that'll increase your music's clarity. These speakers will give you a solid boost in sound quality, even when powered by your factory radio.experience vibrant and high quality sound while listening to a variety of music styles. Manufactured using advanced manufacturing technologies, Grilles not included. If you have any questions about this product by JVCAudioBundle, contact us by completing and submitting the form below. If you are looking for a specif part number, please include it with your message.